This post is for posterity’s sake, for the moment when I scratch my head and think ‘was it that hard?’; here is my answer to that future question of mine. I’ll need to answer that question when the veil of amnesia comes over me when my youngest is say, five years old and I wonder if it was difficult at all. This post is for that time, in answer to that question. Lest I forget. Lest I forget and wonder what the mother with three young children is making such a fuss about, why she looks like she’s just been dragged backwards along the farm yard by a tractor, why she always looks like she needs coffee and why you suspect she grabs chocolate bars in the quiet refuge of the pantry. Yes, it was most definitely hard. I can’t decide which is more difficult, getting them to school or dinnertime. It’s the flip of a coin. To set this particular scene, I need you to imagine the heaviest downpour of rain known to man falling over a farmhouse in North Kerry at 8:50am on a Wednesday morning. Ash Wednesday to be exact (we could go a step further by saying it was somewhat appropriately Ash Wednesday, but let’s not be dramatic). The eldest son is learning to tell the time and so offers ‘helpful’ reminders of the approaching deadline of 9 o’clock every time the long hand moves, which is every 60 seconds I can tell you. The middle child has had his first nose bleed, just as you are trying to squeeze wellies and coat on the toddler-baby who is wriggling around, frankly, being awkward. Nose bleed alert in place, I run (trying to be calm and upbeat about the bleeding four year old’s nose, how’s that for a challenge?) to find something to stop the bleeding, anything; toilet roll, tissue (if only), teatowel, a rug? Eight minutes to 9 o’clock the eldest announces, about to have an existential crisis on the speed of time passing. Nothing will stop the blood flowing while the bleeder now tells you there is no way he could go to school, while putting a hand to his forehead in a reclining pose. Crash, what’s that? Why of course, today is the day the toddler-baby-monster learns that the footstool helps him to reach the kitchen table and he can drop items on the floor and they make hilarious noises. Clang. Hilarious. Six minutes to go. Blood still spurting I would say. 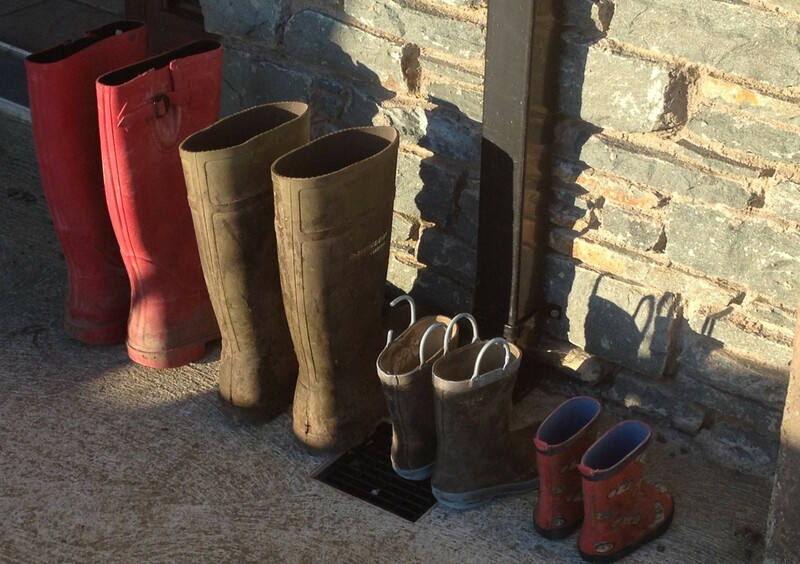 Baby type person has taken off his wellies and coat as the eldest looks on appauled, one eye faithfully on the clock. Clonk. Five minutes to go. Arrrrgh. Keep calm, visualize a calm seafront. Bet others mothers don’t have to deal with this? Why me? Is it just me? Crash? Nose bleed is stopping. Into the car. Pouring rain drowning all little people in the few metres it takes to get from the front door, luckily washing away all traces of blood on the faces concerned. Must remember to teach him, again, to tie his seatbelt. Lunchboxes? In the car. ‘I’ll wash you now with wipes’ I say while wondering if would be better to keep him at home? One minute to nine, we arrive at the school gate, wet, bloody, downtrodden from the trenches. This entry was posted in Uncategorized on February 10, 2016 by annebennettbrosnan.